Despite its size—32,000 acres of grapes, and 11 AVAs growing 40 varietals that can be sampled in more than 200 tasting rooms, most of which are family owned—the vibe is nothing if not laid-back. The historic town square is circled by shops and chef-owned restaurants. 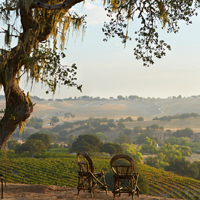 Highway 46 is a bucolic drive with more than a dozen wineries that pour in barns, cafes, underground caves, and cattle ranches.